Need a Bluetooth audio receiver for your car or home and don’t know what to choose? Have a look at our list of best Bluetooth receivers for different purposes as well as of different prices. We’ve selected only the best products which will make your life easier and free of unwanted wires. What you will definitely like about this Bluetooth receiver is its price. But who won’t if it costs only $20? Still, except for being so affordable Etekcity Wireless Bluetooth 4.0 has some features which will also make you just love it. Etekcity Bluetooth receiver will easily enable your speakers with 4.0 Bluetooth for wireless audio streaming even from 33 feet distance. Note that it can adapt via A/V, RCA, and 3.5mm AUX/jack input as well. 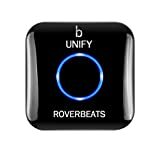 It means that you can use this Bluetooth receiver with your car stereos or home theatres. Add to this NFC Instant Connection and you will get a receiver, which can amplify the audio of your device just with a button press. By the by, Etekcity Wireless Bluetooth 4.0 consumes not much energy and has a fast recharge. It can work up to 10 hours on a full charge and needs only 2 hours to recharge. 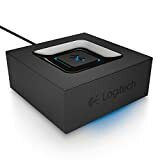 Having multipoint Bluetooth connectivity Logitech Bluetooth Audio Adapter allows simultaneous pairing of such devices as smartphones and tablets and provides music streaming from any of them. It has an option of easy pairing with just a light gesture of your hand. What is more, Logitech Bluetooth Audio Adapter allows automatic re-pairing. 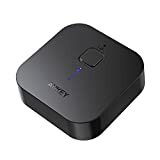 If the precious Etekcity receiver supported Bluetooth streaming from up to 33 feet distance, this will allow you enjoy your favorite tunes from 50 feet. We’d like to underline the fact that this Logitech adaptor works with all speakers. Just plug it into any PC speakers or home stereo systems using RCA or 3.5 mm jacks. This is the priciest product among the best Bluetooth receivers which you can find on our list. Be ready to spend almost $190 but for this money you will get premium options offered only by this receiver. Audioengine has already recommended itself as a provider of such high-quality products as The Audioengine A5+ 2.0 speaker system. Having this receiver you will be allotted wireless music streaming at home or any other place you prefer. 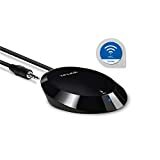 All you will have to do is to connect your device to the B1 Premium Bluetooth Music Receiver just plugging it into the sound system. By the by, this receiver has an easy setup what makes it a very attractive product for all consumers. You won’t need any additional software. Just remember that when you plug B1 into your music system, it turns into pair mode automatically. Then you turn on a Bluetooth option on your device and select the Audioengine B1. As you can see, there’s nothing difficult at all. The aptX codec (a high-grade audio converter), a special circuitry and a precision-tuned antenna for extending of the wireless range, add Audioengine B1 more versatility than any other Bluetooth receivers. 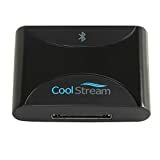 CoolStream Duo is not as expensive as the previous receiver model but it doesn’t mean that it is not as good too. 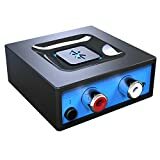 This Bluetooth receiver/adaptor is highly compatible with any device that supports Bluetooth functions. And there’s no difference whether it is iPhone or Android, as it’s compatible even with Victory Motorcycle iPod cable. Still, keep in mind that CoolStream Duo won’t be supported by all models of Mercedes and Audi from 2009 till nowadays in case you use the 30 pin iPod cable. For such case, there’s CoolStream CarPro to use with car iPod cables. This receiver is suitable for music docking stations like Original Bose SoundDock, Bose SoundDock I, SoundDock II, Portable SoundDock or SoundDock 10. Besides, its rechargeable battery has 5-hour life and you won’t need to use a charge converter. 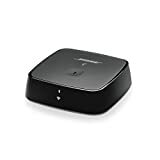 If your device has optical, AUX or RCA output then it can easily become a SoundTouch wireless system, as this Bose SoundTouch Link Adaptor supports all of the pre-cited outputs. But if you are a lucky owner of Bose music system then this adaptor will be something more than just a perfect match. This link adaptor offers a wireless access to all your favorite playlists and services such as Deezer or Spotify. Besides, Internet radio stations, as well as your stored music libraries, will be also on this list. You’ve got all your best tunes stored on your phone or tablet? Then just turn on Bluetooth option and pair your device with Bose SoundTouch Wireless Link Adaptor which also serves as a Bluetooth receiver. And if you own SoundTouch speakers then you can use the SoundTouch app to get a total control over your playlist just from your tablet or smartphone. What is more, you will decide how many and what speakers will deliver your favorite music. Easy control, long-lasting battery life and low price are key features thanks to which Mpow has also become one of the best Bluetooth receivers. 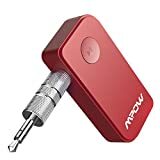 Mpow Bluetooth Receiver can also serve as a car adaptor and can be connected to your headphones via 3.5mm audio cable/adapter. By the by, Mpow has 30 feet of Bluetooth range in open space. But note that such distance is available only without any obstacles. This Bluetooth receiver is also highly compatible and supports such devices as MP3 players, tablets, smartphones and others. What is more, it is a great choice for home sound systems. Mpow doesn’t require any extra skills for its control. This Bluetooth receiver will allow you to control not only music but also phone calls and volume. You will also like this receiver for its durable battery. Mpow offers really long play time of up to 10 hours. Besides, it will take you only 1.5 hours to recharge it. This tiny device connects to your wired devices (speakers, computers, headphones, and more) to allow them to accept a Bluetooth connection. As a result, you’ll be able to listen to your favorite Spotify playlist on your high-end speakers without losing the freedom to use your phone/tablet however you want. Furthermore, the AUKEY BT receiver accepts two simultaneous connections, so you can connect both your computer and your phone to the speakers. But its uses don’t stop here! The device can also be used in an older car that doesn’t have integrated Bluetooth. You can use it to stream music or take calls. You will need to charge it at some point, but it takes about 13 hours of play time to empty its battery, so you don’t have to worry about this too much. Also, it turns off automatically after 15 minutes of not being connected. Looking for perfect sound quality and easy setup for a low price? Meet Esinkin Bluetooth receiver. It has a reasonable price, is simple in use and is highly recommended by customers. Esinkin pairs with Bluetooth enabled devices quite fast and all you need to get wireless music streaming is to press on the top of the button. By the way, this Bluetooth adaptor can receive Bluetooth signals from up to 35 feet distance. Smartphones, iPhones, tablets – all these devices are compatible with Esinkin receiver. The only requirement here is to be Bluetooth capable. This is a device that can solve all your wireless connectivity problems! Let’s say you have a bunch of wireless devices (headphones, phones, tablets, and the list could go on) – you can use the 1Mii BO3 to simultaneously connect several of them to an audio source. Next, let’s say want to make your TV or old-fashioned speakers wireless – the 1Mii BO3 transceiver is the device for this. 1MiiBO3 can both receive and transmit Bluetooth signal at a range of about 230ft (70m) in any direction (due to the dual-antenna design). It works with TVs, PCs, DVDs, Roku, soundbars and speakers, and the list could go on. It can also be integrated with Alexa. Furthermore, the transceiver is equipped with aptX Low Latency technology to eliminate the audio delay that tends to happen with BT devices. It can also deliver perfect audio quality to two devices simultaneously. As a receiver and a transmitter, the 1Mii BO3 can get signal using both analog (RCA / 3.5mm AUX audio for speakers or TVs) and digital (optical) input and output. Also, you can use NFC technology to connect your phone or tablet to it. Another Bluetooth receiver that will set you free from annoying wires is TP-Link HA100. This wireless audio adapter provides music streaming right from your tablet, smartphone, PC or any other Bluetooth device. It’s equipped with amplifier chip and CSR chip that supports Bluetooth 4.1 and A2DP v1.2 which deliver wireless music streaming from such platforms as Pandora, Spotify, Apple Music, and others. TP-Link HA100 has up to 20 meters (66 feet) Bluetooth range and guarantees quick and simple NFC pairing. This wireless adapter is a great choice for drivers as it turns on and off automatically with a car. By the by, it supports connection with two frequently used devices and switches audio source flawlessly. This combination of a transmitter and receiver supports the latest Bluetooth 4.1 version and can be paired with two speakers or headphones simultaneously. Its aptX Low Latency technology eliminates Bluetooth audio delay. It means that you can watch video and listen to music in excellent synchronization. 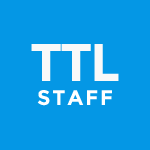 Note that this technology supports TX mode only. TaoTronics TT-BA09 has a long battery life with up to 15 hours of using. In addition, it allows charging and streaming at the same time. Another great plus is that this Bluetooth receiver automatically re-pairs with the devices paired before. 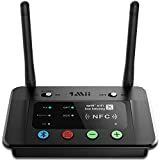 As it supports 3.5mm (AUX and RCA) and optical (TOSLINK) digital inputs and outputs this makes TaoTronics TT-BA09 one of the most flexible transmitters. Music without wires is possible and Bluetooth receivers can help you experience it. Find the most suitable receiver on our list and enjoy music wherever you want. For every bluetooth product, please list the audio codecs that it can handle. This information is crucial. Agreed !!! Codec is essential. Without AAC, iphone is reduced to lossiest codec !! 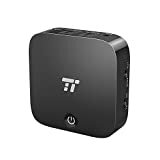 TAOTRONICS TT-BA09 has the same description as TP-Link HA100. Only Pros and Cons are different. Please fix. Thank you for letting us know. Fixed.